Words we all love. Feelings we want. Even crave. We may love God, but being that he's invisible, words like "comfortable" seem to feel better faster. "God, we will do anything. 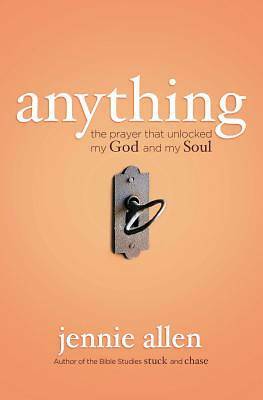 ""Anything, """
"Bible teacher Allen (creator of the new Stuck DVD Bible study) comes out of the gate strong, displaying accessibility and purposefulness in her first book. With an eye to the fears and doubts teeming beneath the surface for many female churchgoers, she compels her audience to figure out what's stopping them from using their God-given talents, and to be willing to do anything that God asks of them. By giving readers a glimpse of her own introspection and the interior life she's revealed on her personal blog, she employs heartfelt honesty to connect with readers. Tales of loved ones who have taken the "journey to total abandonment" show how giving one's life over to a higher purpose can "wreck" comfortable lives--and allow people to seize more important opportunities. Though the book is aimed at women who must balance their calling against more practical tasks like finishing the laundry and shopping at Target, Allen's friendly yet urgent messages will have the wheels spinning in the minds of all audiences and may be the tough medicine that propels them to action." Author, """""I Will Carry You """and"""""" What Women Fear"""